In this thread I will post stuff from the book – “The Imperial Age of Kannauj” written by Shri KM Munshi. It was an age of great achievement for Hindus. The all conquering Arabs were beaten back and Nepal was taken back from Tibetans. Rashtrakutas were based in the South, Pratiharas in North West and Palas in Bengal. A little background. Area btw Haridwar and Unnao was called Aryavarta in post Vedic times, later on the name was used for entire Bharata and Madhyadesha was used for the original area(current state of UP). Forward to 712 the Arabs had conquered Sindh and in 725 under gov Junaid invaded the mainland overruning Saurashtra and reached Ujjain. At this time a hero by the name Naghabhata emerged and rallied the various Kshatriya clans of Raj, Guj, MP…. The Rashtrakuta was founded by Dantidurga around 750, he was a fuedatory of the Chalukyan Empire and overthrew it. …in the Battle of Navsari in 738 ending Arab designs of conquering Gujarat. Dantidurga set up his capital in the city of Manyakheta near modern day Sholapur. He then expanded northwards defeating the Pratiharas near Ujjain. The Pala empire too is established around 750 when the eminent men in Bengal elected Gopala(hence the name Palas) as their king to end the anarchy prevelant in those parts. All three wanted to control Kannauj and the nearby Ganga valley. Nagabhata was succeeded by Vatsaraja, Gopala by Dharamapala and Dantidurga by Dhruva. Dharampala decided to march on Kannauj from his base in Bengal. Vatsraja gathered his foces and met Dharampala somewhere in the Gangetic doab. Vatsraja won a convincing victory and captured Dharampala’s imperial standards. along the banks of Narmada and was waiting for the right time to strike. After the Pala-Pratihar battle mentiond above he crossed the Narmada and met Vatsraja’s army near Jhansi. Dhruva then turned towards the remaining Pala army in the Doab. He gained a quick victory and Dharampala retreated into Bengal. The damage suffered by the Pratiharas was much more severe than the Palas. ..into Kannauj. Armed with glory and rich booty he returned back into Deccan. Dharampala had gotten away with a good part of his army intact. With the Pratiharas badly damaged this left the North on a platter for Dharampala. ..installed his own puppet king Chakrayudha on the throne of Kannauj. ..an internal rebellion by his brother. Nagabhata then marched on Kannauj and captured it from Chakrayudha, the Pala puppet. Dharampala gathered his army and met Nagabhata. The Pratiharas won a decisive victory and Dharampala retreated back. But history was to repeat itself. Govinda had consolidated his power by now and decided to follow his father’s footsteps. He crossed the Narmada and met Nagabhata’s army in Bundelkhand. Rashtrakutas won again and Nagabhata retreated back into Rajputana. Dharampala and Chakrayudha submitted to Govinda(they proba..
.bly invited Govinda to attack Nagabhata). Satisfied with the win Govinda went back to Deccan and Dharampala once again extended his sway over large parts of North India. 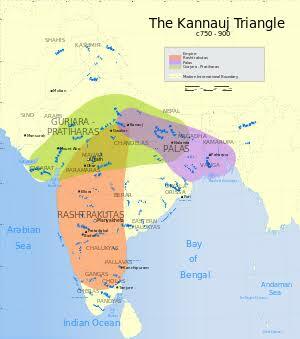 ..Palas and Pratiharas consolidated their position against the Rashtrakutas and took over some frontier territories. Mihira Bhoja ascended the Pratihara throne following his father Ramabhadra(who was a weak ruler). He ruled from 836-882 was a remarkable king and took his empire to new heights. 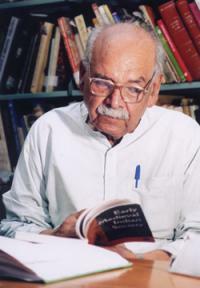 It was during his time that Kannauj became the permanent capital of Pratiharas. ..consolidated his power in Rajputana. ..he moved against the Palas and defeated them convincingly moving his territory right upto Bihar. To the south he defeated Krishna II, Amoghvarsha’s successor along the banks of Narmada and extended his rule over Malwa and Gujarat. He thus ruled over most of North India. Arab traveller Suleiman in 851 wrote of Bhoja and his empire – ” No Indian king has a finer cavalry. He is unfriendly to Arabs and is the biggest foe of the Mohammedans”. Bhoja repelled many muslim/arab attacks and secured our western border. Bhoja was succeeded by his son Mahendrapala who ruled from 883-907. He maintained the territories of his father. The Pala empire disintegrated after Devapala’s death in 850. His succesors were unmartial and were defeated by Pratihara and Rashtrakutas. Palas became a local force..
..and their territories taken over by their rivals. Mahipala acsended the Pratihara throne around 908. Al Masudi, a native of Bhagdad visited and attests to the great power and resources of the king of Kannauj and the general peace and prosperity. It was not to last however. Indra III came to Rashtrakuta throne in 915. He had the same expansionist design as of his ancestors Dhruva and Govinda. He crossed the Narmada and then the Yamuna around 918 and destroyed the city of Kannuaj. Mahipala ran for his life. The descendants of Mahipala continued to rule but there was a steady decline in Pratihara control over their dominions. Further blow was given by Krishna III the Rashtrakuta ruler who led another raid on the North in 963. The Pratihara empire soon disintegrated and 3 powers emerged from it – the Chauhans of Rajasthan, Solankis of Gujarat and Paramars of Malwa. Descendants of Krishna III were weak and unpopular. The Paramar king Siyaka crossed the Narmada and sacked the capital city of Rashtrakuts, Malkhed. Thus ended the age of the three empires. In history books in school we read that Harsha was the last great North Indian king. In my view however this title should go to Mihira Bhoja who ruled over an area probably larger than Harsha. The Pratihara was the last great North Indian empire of the ancient times. Even Dharampala and Devapala were great Northern kings. This period is often overlooked in our books which jump from Harsha to Ghazni. But then we know our textbooks are a pile of crap. The chief contribution of Pratiharas was their successfull defence against invasions from the West. From days of Junaid in 725 till Ghazni in 1020 they acted as a bulwark against Mohammedan invasions. Pietro Della Valle travelled extensively in Asia and saw thousands of Indian merchants in Iran. His observation is interesting in sense that it shows Indian community went out of way to maintain their tradition of strict vegetarianism in hostile Islamic nations. Before we get into the details, let’s get a macro-view of the Indian economy over the past 2000 years, as per Angus Maddison – a mainstream British economist. So we know that Maddison’s view corresponds to the “Mainstream” view we outlined at the start- India was not much richer than a subsistence economy from 1AD right up to 1973. Its share of world GDP was merely a reflection of its population share. We all know that back in the year 1AD – North America was a wilderness, and a hunter gatherer society India was a society with large empires, considerable urbanization, copious literature, among other things Western Europe : Was a part of the massive Roman Empire! Yet as per Maddison, Western Europe, India and China (three very advanced societies in many ways) were only marginally richer than the hunter gatherers in North America! It seems incredible, yet nobody has challenged Maddison sufficiently on this yet. As per Broadberry / Bishnupriya, there was quite a significant decline in Per-capita GDP between 1600 and 1800. And this was the period of Mughal zenith! So clearly the numbers here don’t speak too well for Mughal India. So clearly the decline of the Indian economy started long before the establishment of British Raj, and coincides with the heyday of the Mughal Empire. In fact it is striking that PCI in India in 1600 (at the start of the decline) at $682 was higher than the PCI in 1950 of $619! Parthasarathi’s numbers are at odds with Maddison’s estimates that British PCI in 1800 were at $1707 and hence over 3 times the Indian PCI of $533. But what’s undeniable however is that all data points to a decline starting 1600 and continuing unabated till 1870s… And we must be careful to note that the first part of this long period of decline actually corresponds to Mughal heyday and precedes the Empire’s decline! Clearly what we see is that while growth did resume circa 1870 – it was much too slow relative to the West, In fact the gap between India and the West was way bigger circa 1998 and even marginally bigger in 2017 than in 1870 – the heyday of the British Raj. In fact the gap between US and Indian per-capita incomes was much wider in 1998 than in 1950! And it is almost twice as wide in 2017 as it was in 1870! So while India did start growing post 1870, we have only regressed in a relative sense, because we have been totally out of step with the pace being set in much of the developed world. The Nehruvian period is best described as “License Raj” – a planned economy set-up where companies needed as many as 80 licenses often to produce something. While the activity remained in private hands to a significant extent, those hands were chained and hobbled by the state. But this was different nevertheless from the Indira Gandhi era, when state control went beyond the granting of licenses. Instead the state got into running business. A period when large parts of the economy, including the banks were nationalized, arbitrarily. What is important to note here is the massive decline in the growth rates of the Industrial sector during Indira’s long reign – a much lower CAGR for the sector than what was achieved in the Nehruvian years. So the overall growth rates can be misleading. It is the industrial sector’s growth which tells you how bad the Indira years were. The first major round of reforms was in 1991 under Narasimha Rao when India did away with much of the old License Raj, reduced tariffs on many goods, liberalized trade, and also allowed FDI in many sectors. 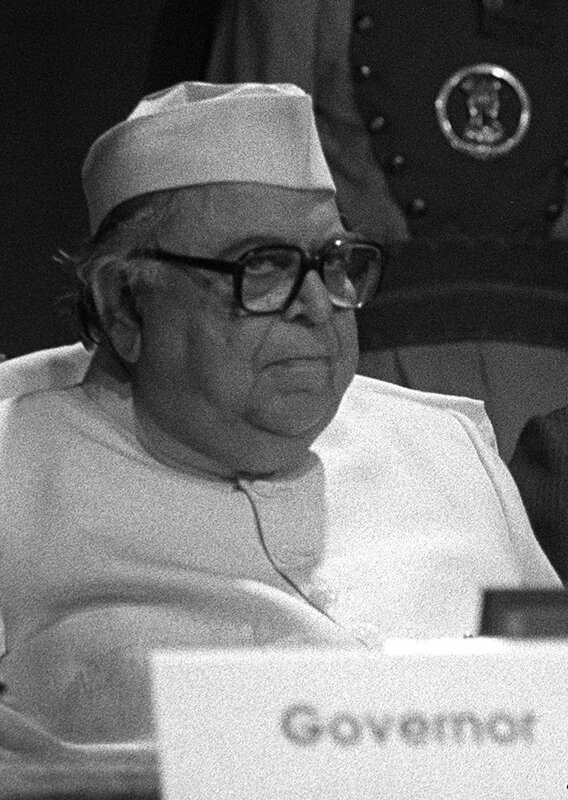 The second round was during the early 2000s under Atal Vajpayee, when the focus was more on reducing state control of businesses – Disinvestment and privatization were high on the agenda in these years. But since then the reform process has stalled for the most part under UPA rule, with lukewarm efforts by the Modi govt that succeeded it. 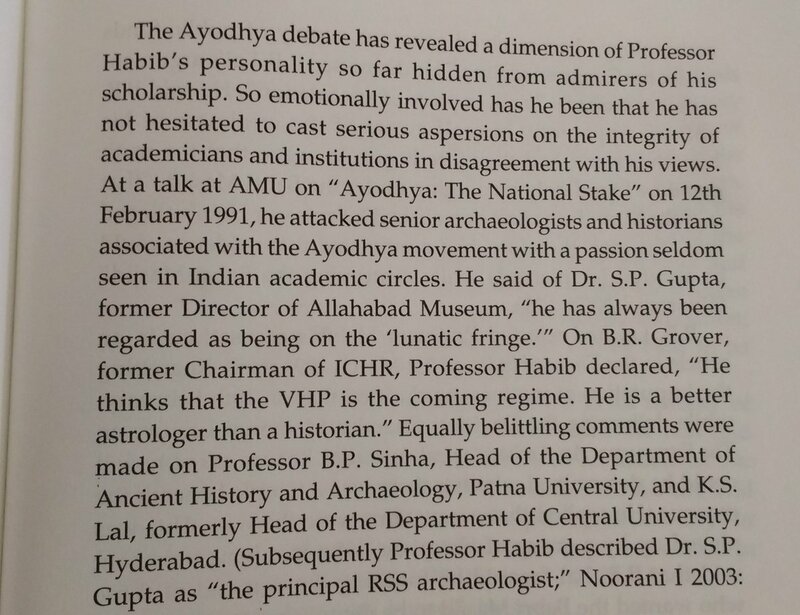 Tragic truth of how Marxists (in exchange for supporting Indira Gandhi during emergency) captured Indian academia, totally ruined its quality & assassinated Indian historiography to serve their vulgur primitive ideology. 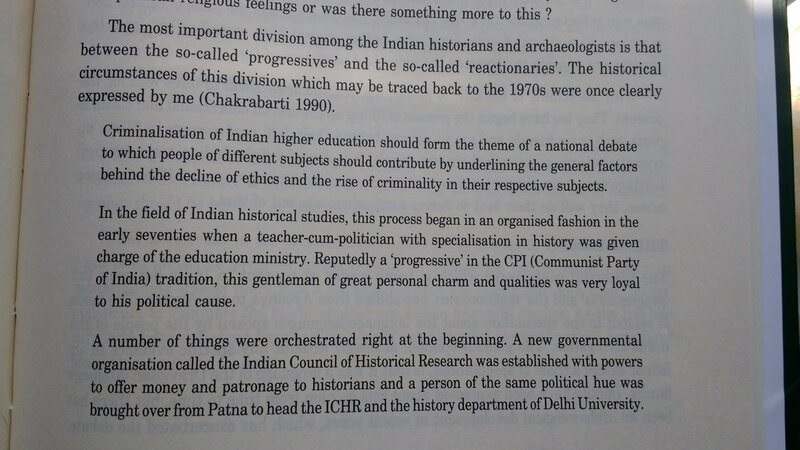 1/9)Noted archaeologist Dilip Chakraborty describes how Indian marxists hijacked the field of Indian historical studies during emergency. 3)part of the deal for the CPI support to Indira for emergency. He built entire institutional structure so as to make it easy to control. 6)…being the dark age. 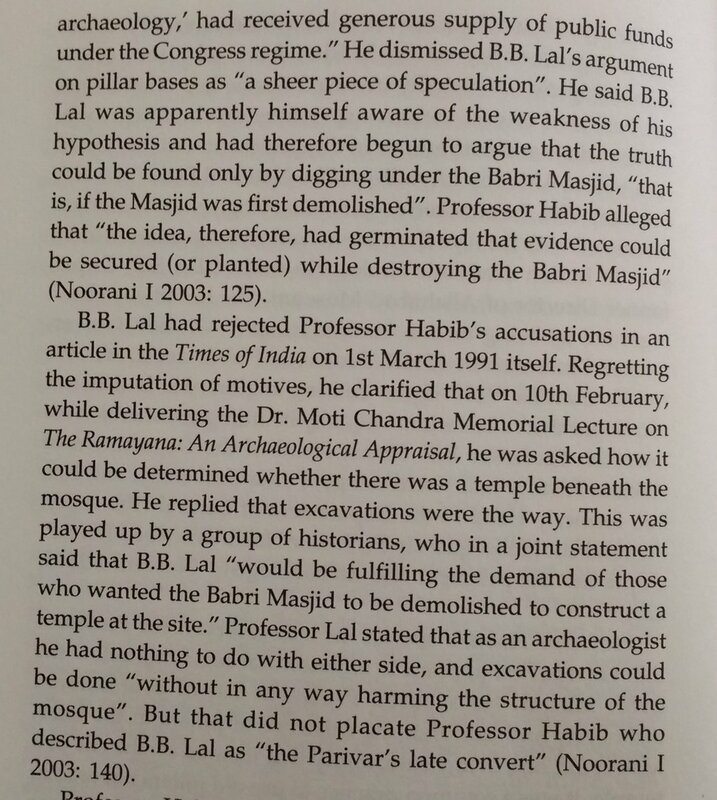 Even though finally wrapped under the garb of “scientific” and concretely backed up by his pawns, it completely..
8)..entrenched in their position that they could even openly fabricate lies like Ram Temple never existed. Today people like Nurul Hasan &..
9)..R.S. Sharma are praised as doyens of Indian history while in reality these are the murderers of Indian academia in field of history! 11)Their wrath was specially reserved for B.B. 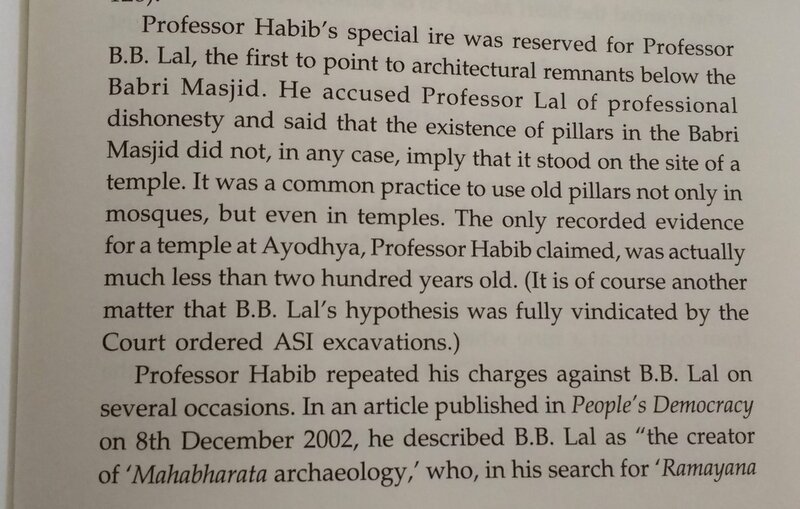 Lal – our most eminent archaeologist for being the first one to give evidence of Ram temple.